I remember back in undergrad when I had a small safety incident in one of my labs. We were doing an extraction of . . . something or other. Part of the experiment involved an extraction using a cooled Rotovap extraction. This particular extraction needed a very cold trap. We were using dry ice in an acetone bath (-78℃/-108℉). As I was putting in a block of dry ice into the acetone, the warm (relatively speak) acetone flash sublimated the dry ice. This sudden expulsion of nitrogen gas splashed the acetone out of the container and all over me. Thankfully, I was wearing my safety goggles. 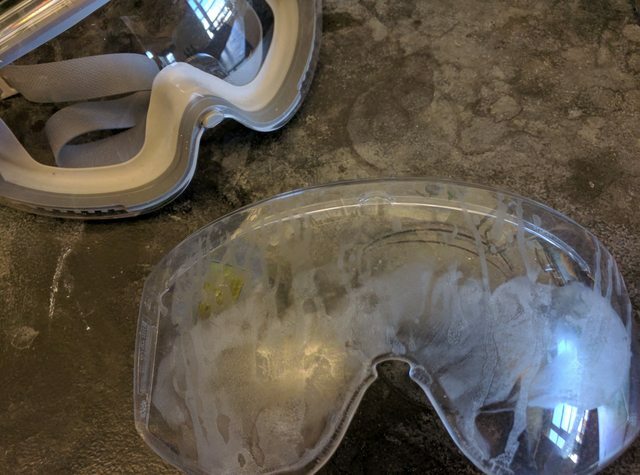 The acetone splash dissolved the plastic of the clear shield on the goggles and permanently ruined it. Thus, I now have a set of acetone melted goggles. My acetone melted goggles are actually a handy little accessory to have on hand. I always take it to the first day of any lab section I teach. When I give the requisite lecture about appropriate lab behavior, I like to pass these around. Even if the students are fresh and don’t know about acetone on plastic or sublimation, they will recognize that goggles saved my eyes. Hopefully the point sticks a bit better with them, and they understand the importance of safety in the chemistry lab.